Thread: Were the moon landings faked? 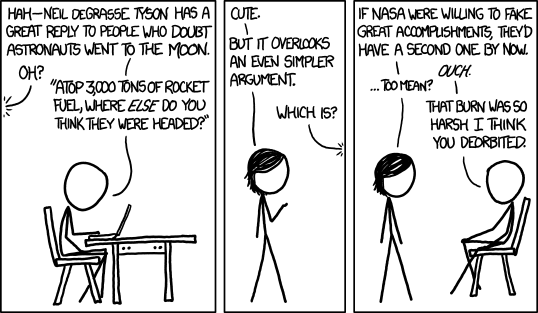 Re: Were the moon landings faked? Sorry but this has been debunked more times than I can count or would want to. The bit that hit home to me was the fact that during WWII the American Navy set up listening posts ringing the Pacific ocean and even with the technology available were able to make informed estimates about Japanese fleet positions based on the difference in time between when a radio signal was recorded in different locations. There are a plethora of reasons to debunk the moon landing deniers but my main reason is how were we able to bribe the USSR into not to revealing that the telemetry broadcast from the Apollo missions was fake? After all the reason the missions were funded was to prove how much better we were than them and if the radio transmission to and from the moon weren't really to and from the moon, they would have known about it. So why didn't they rub that in our faces? Anyway there's no way in hell I'll waste an hour of my life watching your youtube link, you got an argument to make, type it out. If that's too much work for you then save us both some time and admit it. But if you do wish to address this issue with the hopes of making a point, please read through this website and tell us where they got it wrong. I don't know Mr. Plait personaly but we were both posters on the same messageboard for an amount of time and the man is smart as hell and knows his stuff. And he's more patient with deliberate idiots than even I myself am. Last edited by GlimDropper; 06-30-2012 at 11:05 PM. The Straight Dope: Was the Apollo moon landing a hoax? I will confess when I saw the thread topic and user name combination it did make me wonder if "AllSeeinGuy" might be a close relative of "Seethruart" who started this thread over on the SDMB. Hah, even Mythbusters busted this myth. IIRC, some conspiracy theorist yelled at Buzz Aldrin, telling him to confess to faking the moon landing. Buzz Aldrin allegedly laid him out with a punch. AFAIK the guy was a religious fundamentalist. Buzz has a fairly christain background and they guy produced a Bible and asked Buzz to swear on it that he went to the Moon. That pissed Buzz off. Another thing is some of the conspiracy theorists dont mention later Apollo missions just Apollo 11 being faked. Althought some also mention the rover. I was walking through the stacks under a library one day and came across "Dark Moon" the book that caused the recent resurgence in "moon hoax" theories. And a ilm "Capricorn !" did much the same in the 1980s. Dark Moon fairly does lay out all their arguments. The above "bad Astronomy" link by the excellent Phil Platt totally dismantles all the Dark Moon theories. Yes, I was in my teens when Capricorn 1 came out - that age when conspiracy theories seem believable (not that Cap1 was meant to be a doco). Even then, I had to wonder that if they really did fake it, how did they keep the 10's of thousands of people who worked on the project around the globe (either directly or through contractors) quiet? You can visit public observatories today, and if timed right you can distinguish mans presence on the moon. I purchased a coffee-table book of Amazon a couple of years ago, beautiful big prints of photo's taken on the moon by the crew. Awesome stuff! Best video I've seen in a while. I have "Dark Moon" on PDF somewhere, one of the random downloads I came across. scratchycat and Poyol like this. EagleOne, Poyol, Joe_Shmoe and 1 others like this. "There's a sucker born every minute"... which wouldn't be so bad if there wasn't a sociopath to exploit them born every hour. Is it safe to assume that the same people who think the moon landings were faked also believe in those silly 9/11 conspiracy theories? Last edited by EagleOne; 01-20-2014 at 04:41 PM. You hit the spot right there!